On Saturday evening, 16th January 2016, the Wildrunner team watched helplessly from the start/finish location for race 2 of the Spur Cape Summer Trail Series®, as the forested hills and farms of Lebanon in the Elgin Valley were torn apart by vicious wildfires. At 9:49pm we were left with no choice but to cancel the event. The CSIR centre just to the east (upwind) of our routes, had at this stage been surrounded by the fire. 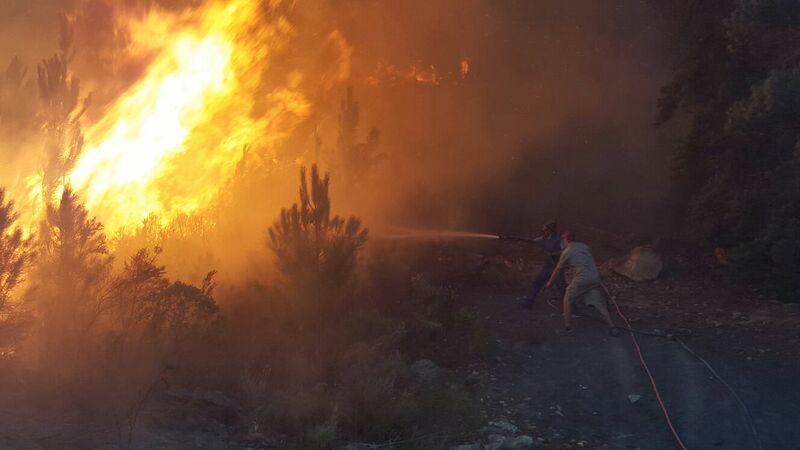 On consultation with local disaster management and the owner of the farm it was clear that the fire was continuing unabated into the heart of the Lebanon plantation and onto the Spur Trail Series® routes. To continue with the event as planned would have been irresponsible and negligent. Since making this announcement on all the channels available to us at the time, we have received a number of queries regarding refunds, postponements and ticket transfer as well as suggestions of donating entry fees to the much needed volunteer fire fighting efforts in Grabouw. In summary refunds, postponements and transferring entries to another race in the Spur Cape Summer Trail Series® are not feasible options - a brief explanation as to why this is, is given at the bottom of this communication. The good news is that after careful analysis of what expenses have not been realised, we have concluded a figure of R35,000 that we are able to donate to the Volunteer Wildfire Services (VWS). This includes a R10,000 donation from Spur Steak Ranches. BOS Sport have also agreed to donate 20 cases of BOS Sport to help keep those weary firemen and women sharp and hydrated! We thank you all for your understanding and support. At this time, our thoughts go out to all of those who have been grossly affected by the fire in the Elgin Valley, and to everyone still on the frontline of the fire. May everyone return safely to their families. If anyone would like to contribute further in any way please make contact with VWS by email on newlands@vws.org.za. We look forward to seeing you at Kirstenbosch Gardens on the 26th January for the next installment of the Spur Cape Summer Trail Series®. Refunds: Due to the specialised nature of the services rendered by our company and third party contractors, entry fees received are invested in the cost of staging the event. The reality is that come race day the majority of the costs required to host the event have already been committed. It is with regret that the event was cancelled at the last minute, however the cancellation was attributed to circumstances beyond our reasonable control and for your own safety. Consequently, we have no alternative but to enforce the 'no refund' policy reflected in the terms of entry, which comply with the requirements of the Consumer Protection Act. Postponement: We cannot postpone for three primary reasons. Firstly, we cannot use the same venue for obvious reasons. Secondly, events take anything from 3-6 months to plan and execute. From booking venues to fulfilling our duties with regards to the Safety & Recreation Act, disaster management and the numerous other channels that professional event organisations are required to follow in the build up to event day. As a result a new venue is not an option. Transferring entries: The primary reason we cannot transfer your entry to another race in the Spur Cape Summer Trail Series® is that this is in effect a refund and for the reasons given above this is not a feasible option. Effect on the ‘Series’ Championship & Challenge? Essentially the Series will now consist of only three races, all of which count towards the Championship & Challenge. I.e. runners who wish to complete the Series still need to run three long courses or three short courses to complete the Series and receive a medal.